Ingrid Pietroniro with her dogs Tyson and Riley. Tyson was stolen from her back yard in February but was found on the street and identified by his microchip. 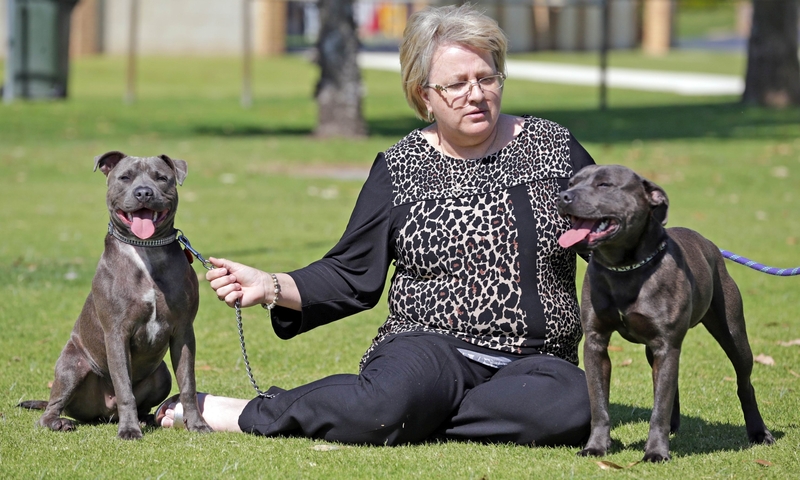 The family, who had owned the blue staffy for just five weeks before he was taken, feared he could be destined for life as a fighting dog. But the family got the amazing news two weeks ago that Tyson was alive and well. Council rangers picked him up wandering the streets in Hamilton Hill after a fence at the home where he was living blew down. Because he was microchipped, the dog was easily identified. The new owners reportedly tried to reclaim him but could not produce a receipt showing where they had bought him. Despite not knowing why the dog was stolen, relieved owner Ingrid Pietroniro said she had tried to stay positive during the ordeal. ‘The whole situation was really distressing,’ she said. ‘Having Tyson out there as a puppy was really upsetting because he was basically just a baby. ‘And with the break-in, even though I’d know I’d locked everything up I was waking up in the middle of the night and double checking because I was so anxious it could happen again. Local Government Minister Tony Simpson said that without the microchip, the dog may never have been reunited with its owners.